After a slew of hugely successful animated hits in recent years, Dreamworks had a nasty surprise with their previous film Rise of the Guardians - not only did critics maul the weak story despite the colourful visuals, but the film also went on to make very little profit and force the studio to undergo an $83 million write down and lay off hundreds of staff members. It was the first time since Bee Movie in 2007 that a Dreamworks picture had caused financial difficulty, but can the studio instantly get back on track with their latest family flick The Croods? Well, let's hope so! 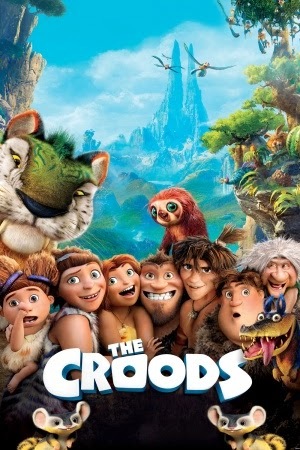 Thousands of years in the past, The Croods are an ordinary family of neanderthal cavemen, living by the one rule of overprotective patriarch Grugg (Nicolas Cage): never leave the cave. Eep (Emma Stone), their somewhat estranged daughter, disobeys the strict guidelines and stumbles across an intelligent human named Guy (Ryan Reynolds), who survives with his intellect and inventions instead of brute strength. When his prediction of the world shattering and ending starts to come true, Guy finds himself tangled up in a quest for safety with The Croods as they all journey to a a safe paradise; one he describes as tomorrow. The Croods is a formulaic story, with scenes that you can predict will happen based on the natural conventions of recent animated films (for example, a scene where everyone falls out with each other). What makes the film emerge successfully from its generic coating is the beautiful wit threaded nicely into the narrative and characters. The Croods is genuinely funny, never trying too hard to make you laugh through dumb slapstick or excessive pop culture references. Whether it's Guy's stick thin build compared to the cavemen protagonists or Grugg's obsession with his wife's mother dying, there is plenty to laugh at from beginning to end for children and adults alike. The Croods also boasts a ton of heart, even if the main romance doesn't feel as natural as it could've been. Each character is incredibly likeable thanks to the stunning animation and fantastic voice acting - Nicolas Cage stands out prominently, instantly making Grugg the funniest character in the film but also one you can feel for during certain scenes. The only main gripe that arises from everything is the iffy pacing, which isn't a complete mess but not fully polished. Emotional moments are sometimes forced aside in favour of humour, which feels like an awkward conversation with a friend who passes off sappy emotion with forced jokes. It doesn't always work, but The Croods remains a loveable family adventure from beginning to end and is far superior to Dreamworks' last effort.